Today February 22, 2011 is "Texas for Illinois Day" to Repeal the Death Penalty! Call Illinois Governor Pat Quinn and urge him to sign the bill to end the death penalty. Many Texans are doing their part today to convince Illinois Governor Pat Quinn to abolish the death penalty in Illinois. On Tuesday, February 22, 2011, Texans are calling the Governor of Illinois to urge him to sign the bill to repeal the death penalty. If Illinois abolishes the death penalty, it will have a major impact in other death penalty states, including Texas. Illinois started with a moratorium on executions in 2000 and now Illinois may abolish the death penalty with just a signature from the governor. Illinois is just one signature away from becoming the 16th state without the death penalty. The General Assembly passed legislation to repeal the death penalty on January 11, 2011. Now the bill is awaiting Governor Pat Quinn’s signature. Governor Quinn has said he encourages people with opinions to contact his office. In the past, he has indicated support for the death penalty, while also expressing concerns about the problems with the system. You can remind him that regardless of his position on the death penalty, Illinois’ history has made it clear that the system is broken. Illinois legislators decided the system can’t be fixed, so they voted to repeal the death penalty. Illinois can no longer afford to keep the costly and error-ridden death penalty. 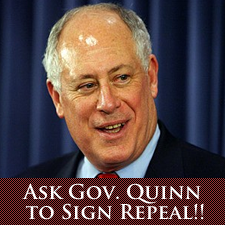 Please call Governor Quinn to tell him you want him to sign the death penalty repeal bill. If you don’t get through to a person or voicemail, please try again. The Governor’s staff won’t ask you for reasons (they only want to know if you support or oppose), but if you’d like talking points or more information, visit the Illinois Coalition to Abolish the Death Penalty website. The Texas groups participating in the “Texas for Illinois Day” have set a goal to confirm at least 200 calls to Governor Quinn’s office. We need you to let us know you made the call. After you call, and you can even call both numbers, please send a quick email to (texasforillinois@gmail.com) or leave a comment on the facebook event page with the word “CONNECTED” in the subject line if you actually spoke with someone, and “VOICEMAIL” if you were able to leave a message. If you get a busy signal, please keep trying until you connect with either a person or leave a message. If anything interesting happens with your calls, please be sure to let us know so that we can pass that on to our colleagues in Illinois. We encourage any and all Texas groups to participate in the “Texas for Illinois Day”, even ones that don’t primarily work on the death penalty issue, as long as your group wants to help convince the Illinois governor to sign the repeal bill. Currently, the groups participating include Texas Moratorium Network, Campaign to End the Death Penalty – Austin chapter, Texas Death Penalty Abolition Movement, Texas Students Against the Death Penalty, Campaign to End the Death Penalty – Denton chapter, and Texas Death Penalty Education and Resource Center.